For example, one could not ignore the continued success of five major nationally and internationally touring Canadian puppet theatre companies—The Old Trout Puppet Workshop, Famous People Players,2 Ronnie Burkett Theatre of Marionettes, Mermaid Theatre of Nova Scotia, and, until as recently as 2012, when the company stopped “accepting bookings” (“Coad Canada”), Coad Canada Puppets—at a time when such endeavors were becoming increasingly difficult to undertake. At the turn of the twenty-first century, a renaissance of puppet theater appears to be underway. In the United States during the 1990s, a theatrical production of Disney’s The Lion King showed that a mask and puppet spectacle could become a runaway hit on Broadway, and the Jim Henson Foundation’s series of bi-annual [sic] International Festivals of Puppet Theater 3 began to expose new audiences to the richness and variety of innovative theater based on puppetry. The “second wave of puppet modernism” as it manifested itself in both Canada and the USA could also be described as a process of institutionalization. In the latter case, it was tied in with the “boost given [to] puppetry by the Federal Theater Project, part of the Works Progress Administration (WPA), from 1935 to 1939." It would not pick up steam in Canada, however, until after the Second World War with George Merten’s workshops in Ontario in the 1950s (McKay, Puppetry 65). Merten, “a professional puppeteer and cultural impressario [sic] from Great Britain,” arrived in Canada, Kenneth B. McKay writes, “in 1950 and was employed by the Ontario Department of Education’s Community Programmes Branch to present a series of puppetry demonstrations through the province” and to conduct “leadership courses for puppetry instructors.”6 His work sparked an explosion of puppetry-related activity, including the founding of a number of guilds within the province. Indeed, “[i]n 1955 it was estimated that Ontario had some 3,000 adult puppeteers7 in over 160 communities.” Merten was in fact one of the founders of the Ontario Puppetry Association (OPA), which was formed in 1956 as “[a]n umbrella organization” to unite the various guilds that had been established in the early 1950s.8 This was therefore an important period of organization, and its most significant outcome, the founding of the OPA, resulted in a force that continues to advance the art of puppetry in Ontario to this day. Merten’s “work drew large numbers of amateurs into the art, thus building audiences, raising the general standard of performance, and, inevitably, attracting some young people who would eventually turn professional.” The OPA honors this tradition, welcoming both professional and amateur puppet artists into its ranks. Keeping an organization such as the OPA active and relevant is no easy task, however. Various puppetry organizations in Canada have been established, reshaped, dissolved, and resurrected over the years, and the labor involved in all of this institutional activity has largely been of a volunteer nature. These organizations have nonetheless had a significant impact on the development of puppet theatre in this country at the municipal, provincial, and national levels. At the same time, these organizations have in turn been shaped by the artists who compose them, as well as by historical trends in puppetry. Although there is often some overlap between such historical epochs, one can still discern, as Bell does, “a third puppet revival” commencing in the 1960s, led in the United States by Schumann’s Bread and Puppet Theater and Henson, and in Canada by the second generation of puppet artists in the Keogh family,9 who “inaugurated Ontario’s first ‘permanent’ puppet theatre, in a summer-season tent at Brooklin” in 1961 before moving “two years later . . . [to] a concrete-and-wooden theatre on one of the Toronto Islands.” There “they performed for three summers until deciding that frequent vandalism and a poorly chosen site made the operation impractical.” This third revival proved a promising counterpoint to the second, as, while amateur puppet theatre and puppetry organizations flowered during the earlier revival, artists such as the Keoghs helped to further the professionalization of the art during the later one. Some aspects of these previous “waves” may now seem incredible. Gone are the days, most likely for good, when an individual directly supported by the government could travel throughout a province, spreading the good word of puppetry and winning over thousands of converts to the cause, for example. Still, even though there is no obvious candidate for the title of “Merten for the Millennials,” there are tools at our disposal now that Merten and other early members of the OPA could not possibly have foreseen. Whether these digital strategies are superior to the older, more material ones in every context remains an important question. The OPA now holds its live events and meetings in rented or donated spaces, relying largely upon its website and e-mail to keep its membership informed about them. These relatively infrequent live meetings are supplemented with virtual meetings conducted by means of Skype and conference calls, which reduces travel costs. Even the official newsletter of the organization, the OPAL, has been available as a PDF file since the Spring 2008 issue, which facilitates electronic circulation. This “digital turn,” however, is not without its concomitant complications. To be sure, the ease of communication offered by the Internet can allow organizations like the OPA to survive primarily in virtual space, eliminating the need to search for grants or sponsors in order to fund the construction or renovation of a series of offices or buildings. At the same time, this can lead to such an organization being perceived as “just another” online entity—but one that has the temerity to charge a member- ship fee! In a situation that parallels other recent digital developments that have called into question the merit of credentials and experience—is there a need for professional journalists when anyone with access to a computer and the Internet can cover the news, for example—young and emerging puppet artists might understandably doubt the value of belonging to a professional association. Indeed, the very structure of such an organization—with specific roles, responsibilities, and, perhaps most damning of all, meetings—has little immediate appeal when compared with the breezy quality of social media sites, to which many puppet artists at all levels now turn for inspiration and information related to the art of puppetry. “More of us might profit by the opportunity to know what the rest of the world is doing,” as Bil Baird declares, and the Internet does offer the promise of this kind of “opportunity” but without necessarily providing sufficient context. Moreover, there is the question of what can be over- looked; not everything has been digitized. Thus, while one certainly can find some images of Osborne Stearn’s creations online, how could one determine how her work fit into the history of Canadian puppetry more broadly or how it might have influenced one’s own work somehow, however indirectly? How would one know to search for her name in the first place? Consequently, if, only a few years ago, Canadian puppetry seemed to be riding the crest of a wave, perhaps we have now slid into a trough. The repercussions of this apparent disenchantment with institutions formerly regarded as critical sites of legitimacy and authority—many still regard them as such, of course—can be discerned in loci outside (and more popular than) puppetry organizations. For instance, it seems more than a coincidence that, as the OPA strives to remain relevant, the Puppets Up! International Puppet Festival, hitherto hosted by the small Ontarian community of Almonte, has been cancelled for the first time. As is emphasized on the website for the festival—ironically enough, it continues to have a life online even now—“[f]or 12 glorious summers, Puppets Up! has been a highlight on the social calendar, a chance for old friends and new to meet, an opportunity to celebrate the strength of our community and the beauty and diversity of the art of puppetry” (“2017”). Since the festival was oriented primarily towards the general public (especially family audiences), most of these “old friends and new” were simply spectators. Nevertheless, Puppets Up! gradually developed into both a forum and something of a family reunion for puppet artists as well. This transformation was catalyzed by a confluence of deliberate measures (such as workshops being presented before the festival proper began) and more organic tendencies (including performers running into one another in the limited number of restaurants available in such a small community). Eventually, the festival had become such an institution –with other organizations, including the OPA, planning their own schedules around it – that it had come to be taken for granted. While a great number of puppet artists and past audience members are undoubtedly hoping that the festival will make a triumphant return in 2018, that does not seem probable, at least not on the same scale. According to the festival organizers, they are planning on “taking some time to think and refocus . . . [their] efforts so that . . . [they] can continue to participate in the community, and to spread the love of the art of puppetry in some new ways.” That said, since their “board has concluded that in all likelihood, . . . [they] cannot present a summer festival in following years” (“2017”), they appear to have a much more limited scope in mind: one of the “new ways” is a hospital fundraiser. An explicitly and radically more local focus is conceivably just what the “festival” (if it can still be accurately referred to as such) needs at this stage in its life cycle, however, especially considering that its organizers have cited “long[-]term financial circumstances as well as a steady decline in all revenue streams, including paid attendance, grants and sponsorships” (“2017”) as the primary factors taken into account by the members of the board in rendering their decision. The inclusion of “paid attendance” in this list is particularly significant in the present context, as those members of the puppetry community who had come to take the festival for granted could all too easily justify forgoing the festival for a year (or even a few years) if other opportunities arose. After all, upon their return, would they not find the festival right where they left it? Regrettably, the same can be said of puppetry organizations, which can also begin to wither on the vine, even if members simply drift away from them; although disillusionment with established institutions is an obvious challenge that those institutions must face, benign indifference is ultimately more pernicious. Furthermore, given that an organization is bound to be perceived by those outside it as increasingly inactive as members wander off for various reasons, this phenomenon becomes a vicious circle; thus, the repercussions of this skepticism should be considered causes as well. With the foregoing in mind, we should expand on Bell’s “wave” theory slightly to add that, for every apparent wave of interest in puppetry, a trough must presumably follow. A trough, however, is not an abyss. Accordingly, just as any excitement or optimism evoked by “the appearance of a puppet renaissance” should be tempered with an awareness of previous similar revivals but not completely (and cynically) dismissed, so too should any anxiety or even despair be assuaged at least to some degree by the realization that so much ground was gained over the course of the last wave that there is little chance of losing it all. UNIMA-Canada, once again a truly national organization, continues to expand, with three regional sections (Québec, Ontario, and Atlantic) now operating. The Puppetry Intensive program at Humber College, one of the rare signs in English-speaking Canada that puppetry is beginning to penetrate mainstream educational institutions, has already begun to influence the Toronto puppetry community, despite having been in existence only since 2013, running for just under two weeks (“Humber”), and not being a degree- or diploma-awarding program. These are but two examples of advances that have been made over the past few years that are in no evident danger of being reversed. If we accept that we are currently in a trough nonetheless, a consequent question must be answered: Is there anything that could (and should) be done to precipitate the next wave? The simple answer is “No,” since the quietude of such lulls can prove advantageous. Following the example of the organizers of Puppets Up!,“taking some time to think and refocus” would be prudent. For an organization such as the OPA that is already explicitly regional in focus, however, tightening that geographical focus further would probably not be a well-received response, particularly since, in the case of the OPA, events and companies in and around Toronto (predictably and some- what understandably) already tend to be emphasized. That said, before the clamor for a new festival or grant program begins to grow, now would be the time to address those matters that so often get brushed aside as “housekeeping,” such as revising funding policies, updating membership lists, adjusting budgets, and so forth—that is, those tedious yet critical (not to mention frequently contentious) tasks that, during busier times, one can always find excuses to put off. To frame and phrase it differently, then, the emphasis should therefore not be placed on attempting to hasten the arrival of the next “puppet renaissance." As visionary and influential as their work was, neither Osborne Stearn nor Merten was probably consciously thinking of launching a new wave of fascination and experimentation with the puppet as a goal in itself. That not withstanding, one must also keep in mind that neither of these individuals (initially, at least) was responsible for running a large puppetry organization either. Doing so requires that priorities be set, schedules be coordinated, volunteers be recruited—in short, a plan of action has to be devised and agreed upon. Even so, coming up with ideas with respect to what a puppetry organization could do next is dangerously easy; ensuring that they are evaluated rigorously and implemented as appropriate is much more challenging. So, is the solution to squash them all, then? Of course not, but, particularly when there is an appreciable dip in the “buzz” surrounding puppetry, a mantra of “Choose one new thing and realize it” would be advisable. Much can eventually come of one new thing, as painfully glacial as such an approach can seem at the time. Still, even impassioned verbal daydreaming has its place; after all, at the very least, it demonstrates that people still care. Genuine apathy is surely the greatest enemy of all. Dr. James Beauregard Ashby is the outgoing President of the Ontario Puppetry Association, as well as the cofounder and co-artistic director of Bricoteer Experiments Theatre (a Toronto-based devised puppet theatre company). He is also an adjunct professor and union activist at the University of Toronto. 1 Some of the material for this article has been taken from the author’s PhD dissertation (see list of works cited). 2 In the company’s current publicity material, its name is rendered as Famous PEOPLE Players (Dupuy). 3 This festival was held every other year from 1992 to 2000 (“Henson”). 4 That puppets need be wholly “material objects” (Bell 8) with which one plays, which would seem to imply that they must be wholly inanimate, is an assumption that should be challenged, as they may also be wholly animate (such as a performer’s hands being isolated and objectified as characters in their own right) or even include both animate and inanimate components (humanettes, for example). 5 Osborne Stearn was one of “the outstanding artistic pioneers” (McKay, Puppetry 61) of twentieth-century Canadian puppetry. In 1923, she and her company, King Cob Puppeteers, “staged Punch and Judy of Long Ago with hand-puppets” in Hamilton. They were “hoping to bridge the gap between the Punch shows familiar to most British Canadians and the newer puppetry in this play by Mary Stewart,” according to Paul McPharlin. Unfortunately, he does not elaborate on what he thought made this puppetry “newer.” He does emphasize the broader importance of this production, however, writing that Punch and Judy of Long Ago was “the first production of the new era” (348) of puppetry in Canada. 6 McKay’s seminal book Puppetry in Canada: An Art to Enchant, published in 1980, remains the only full-length text on Canadian puppetry in general that has been published to date. 7 McKay now concedes that this number, which he obtained from a contemporary newspaper article, is potentially misleading, as it is “hard to tell” how many of the approximately 3,000 individuals that Merten had taught by 1955 continued to pursue the art after their respective courses were finished, as for many of them, puppetry was undoubtedly only “a short-term interest” (Telephone interview, 2 May 2006). 8 All of these guilds have since disbanded. 9 Dave and Violet Keogh, who founded this remarkable—and, as far as I know, unique, at least in the Canadian context—“dynasty of puppeteers that continues into the present” (McKay, Puppetry 61), were contemporaries of Osborne Stearn and thus also part of the first puppetry revival in Canada. John, their son, and Linda Keogh later became “[p] erhaps the busiest puppeteers on Canadian television” (140) during the 1950s and 1960s, as well as respected live artists. Their daughter Nina Keogh, who represented the third generation of puppet artists in this family, would come to work with them in both of these contexts, although it is for her work in television that this now-semi-retired puppet artist is primarily known. Indeed, in 1991, the Alliance for Children and Television conferred on her the Outstanding Contribution Award for her career in television programming for young people (Keogh 24), as Shelley Scott notes in the introduction to her interview with Keogh. 10 At its largest, the collection consisted of approximately 1,600 items (“Puppet Collection”). 11 Tom Vandenberg, who was elected president of the OPA shortly after the original Puppet Centre closed, reveals that, by the time the Puppet Centre closed, the OPA had accumulated over eighteen-thousand dollars in debt (Telephone interview). The North York Board of Education had provided the physical space for the first Puppet Centre, which had been located on the lower floor of the Glen Avon Public School. The Board did offer the OPA a new space, the Cornelius Public School, but the location was rather remote, and the OPA was unable to acquire the funding necessary to install the air-conditioning system—the Glen Avon School was already air conditioned when the OPA moved in—required to preserve its puppetry collection. McKay claims that neither the Ontario Arts Council nor the provincial Ministry of Culture and Recreation was interested in helping to maintain the puppetry collection and support the educational programmes offered by the Puppet Centre, a situation that was exacerbated by cuts to the funding available to schools for arts-related activities, which had limited their ability to arrange bus trips to the Centre for guided tours of the puppetry collection and workshops for some time (Telephone interview, 2 May 2006). Although the funding bodies were still willing to sponsor performances at the new Puppet Centre by visiting puppet artists, the loss of revenue that the Puppet Centre was suffering due to the inability of the institution to store and exhibit its collection permanently at the new facility meant that keeping the Centre open was no longer “financially . . . viable” (Telephone interview), as Vandenberg reveals. Consequently, although the collection was stored at the Cornelius Public School for approximately six months (McKay, Telephone interview, 9 May 2006), it was never publicly exhibited in full. The Board of Governors of the Puppet Centre, having consulted with representatives of the funding bodies that had been assisting them, recommended to the Board of Trustees of the OPA that the puppetry collection be donated to the Canadian Museum of History—then known as the Canadian Museum —along with a significant portion of the OPA archives and resource library. McKay asserts that there were in fact no exhibitions presented at the second location whatsoever (Telephone interview, 9 May 2006), while Vandenberg recalls that “there were some displays,” but these were “likely only the ‘travelling’ cases[,] which Ken [McKay] proballly [sic] doesn’t consider an ‘exhibit’ . . .[,] certainly not on the Glen Avon scale” (“Re: Puppet Centre Funding”). Vandenberg also claims that “a programme of . . . performances” was presented at the Cornelius Public School, although it was “an unmitigated disaster financially” (Telephone interview), due to poor attendance. This was unfortunate, but according to Julia von Flotow, who began working at the Puppet Centre in 1986 as an administrative assistant, eventually becoming the administrative head of the Centre as executive director, “it takes five years to build . . . [public] awareness” of a new facility, and the OPA simply did not “have the money to . . . refurbish” the new location. Moreover, Flotow and the Board of Governors of the Puppet Centre did not “have enough time or resources to . . . develop a programme . . . and a whole operating plan for this . . . new situation,” as all they “could cope with was . . . relocating” (Flotow). Ashby, James Beauregard. 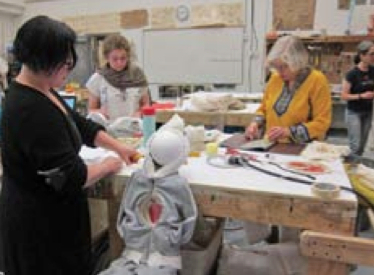 “From the Inside Out, from the Outside In”: Devising in Canadian Puppet Theatre. 2015. U of Toronto, PhD dissertation. Baird, Bil. The Art of the Puppet. Bonanza-Crown, 1973. Bell, John. Strings, Hands, Shadows: A Modern Puppet History. The Detroit Institute of Arts, 2000. “Coad Canada Puppets.” Coad Canada Puppets, n.d., coadcanadapuppets.com. Accessed 27 July 2015. Dupuy, Diane. “Re: Famous People Players Interview Questions.” Received by James Beauregard Ashby, 15 July-6 Aug. 2015. Flotow, Julia von. Telephone interview. 4 Apr. 2006. “Henson International Festival of Puppet Theater: New York.” Henson International Festival of Puppet Theatre. Jim Henson Foundation, n.d., www.hensonfestival.org/home/home.html. Accessed 12 June 2015. “The Humber College Puppetry Intensive.” Humber College, n.d., https://creativearts.humber.ca/continuing-education/courses/puppetry. Accessed 15 June 2017. Keogh, Nina. “A Family of Puppeteers: An Interview with Nina Keogh about Puppets on Television.” Interview by Shelley Scott. Canadian Theatre Review, vol. 95, 1998, pp. 24-30. McKay, Kenneth B. Puppetry in Canada: An Art to Enchant. Ontario Puppetry Association, 1980. ---. Telephone interview. 2 May 2006. ---. Telephone interview. 9 May 2006. McPharlin, Paul. The Puppet Theatre in America: A History, 1524-1948. With supp. “Puppets in America since 1948” by Marjorie Batchelder McPharlin. Plays, 1969. “The Puppet Collection of the Canadian Museum of Civilization.” The Art of Puppetry. Canadian Museum of History, n.d., theatre.museedelhistoire.ca/narratives/details.php?language=english. Accessed 15 June 2017. Smith, David. “Professional Puppeteers and Companies of National and International Reputation.” UNIMA World Encyclopedia of Puppetry Arts, forthcoming. Microsoft Word file. ---. “Report on Puppetry in English-Speaking Canada.” 2000. UNIMA World Encyclopedia of Puppetry Arts, wepa.unima.org/en. Microsoft Word file. “2017 Festival Cancelled.” Puppets Up! – International Puppet Festival, 24 March 2017, puppetsup. ca/2017-festival-cancelled/. Accessed 15 June 2017. Vandenberg, Tom. “Re: Puppet Centre Funding.” Received by James Beauregard Ashby, 13 May 2006. ---. Telephone interview. 9 May 2006.